1. Enter the letters for the monogram, initial(s), or name in the EXACT order that you want them to appear. 2. They will be printed in the font style you chose from the drop-down menu. Protect your iPhone with these durable and stylish cases for the iPhone 6, 6 Plus, 7, 7Plus, 8, 8 Plus. DESIGN: This case has a weathered green tinted barn wood background, boho floral wreath and flowers with a custom personalized monogram. 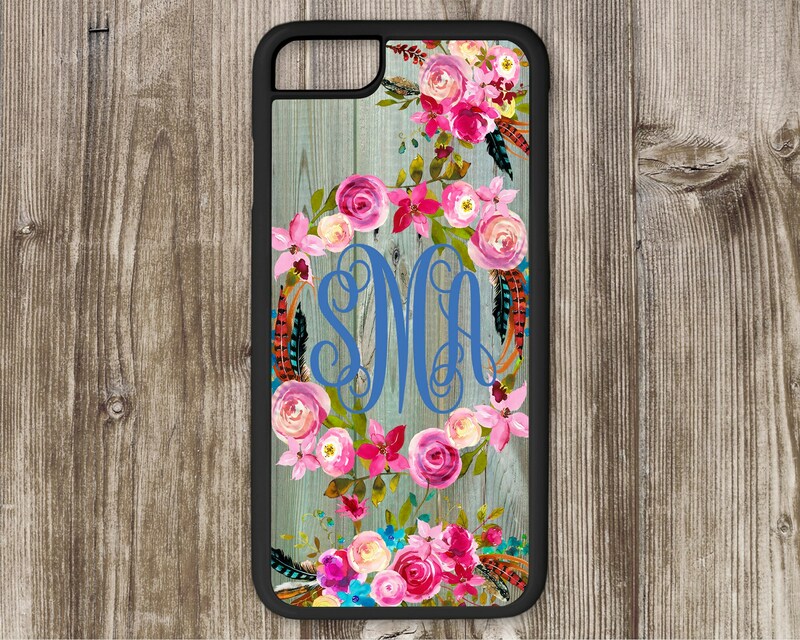 You can also choose to have your initial or initials or name instead of the monogram. These are one piece sturdy plastic cases with a beveled front edge. These cases can be easily popped on and off for wardrobe matching, great for fashionistas, yet still made of very sturdy plastic. Each case is designed and embellished by hand, one at a time, here in my home studio in Mississippi. We use high quality ink and professional printing methods to ensure a superior product. Colors may vary slightly depending on monitor/tablet/phone settings. Background is a printed image. No real wood used in the production of this product. Exactly like the picture. I was surprised to receive shipment so quickly with a special order item and being the Holidays. Love love love the phone case!